This is what I call "the gateway drug" of nail art. It was one of the first semi-complex things I tried, and I instantly fell in love. It appeals to my imprecise nature. You can't mess this up. If it doesn't look right, just go over it again! Step One: Remove your current polish. It's best to start with clean, dry nails. No matter how sad it makes you to see them in their naked state. I applied my base, one coat of China Glaze Liquid Leather, and a coat of Seche Vite. Who has time to wait for polish to dry these days? 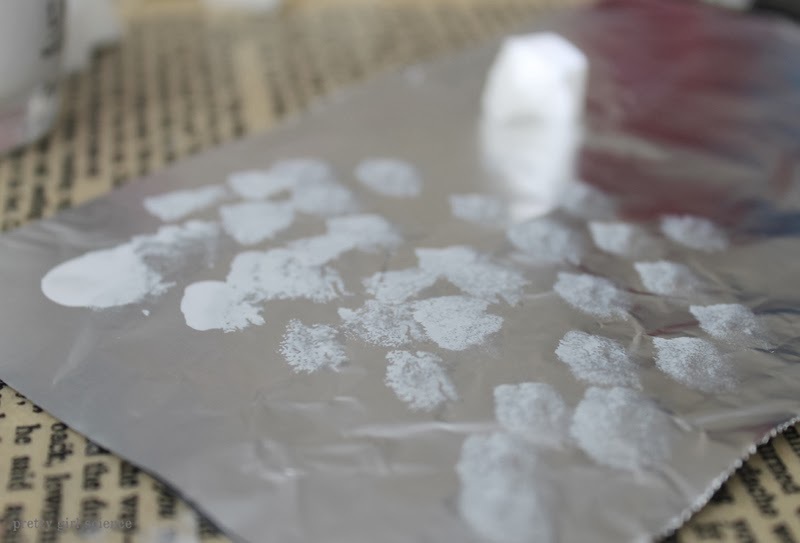 Make a decent sized puddle of white polish on your foil. With your torn bit of wedge, (you get a more random look with torn as opposed to cut. 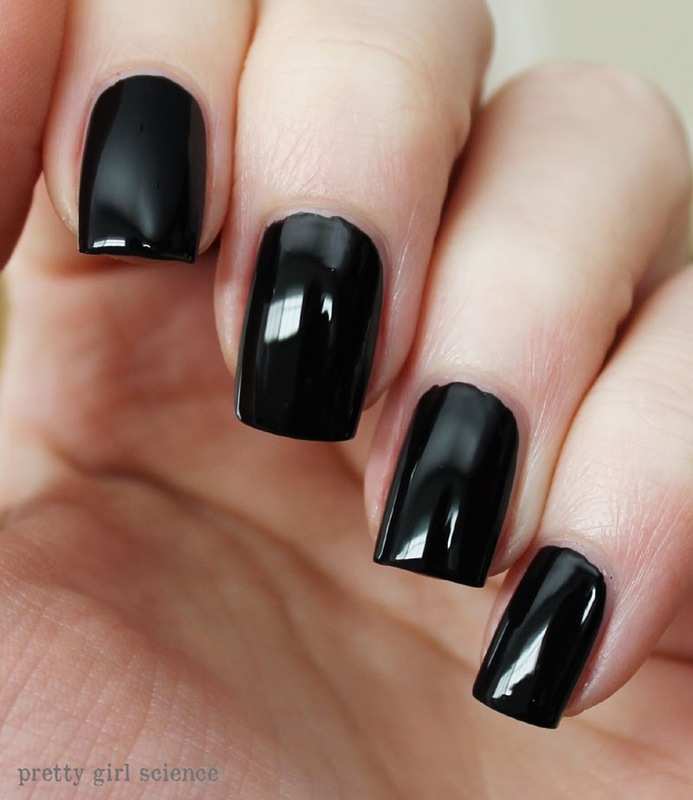 personal preference though) blot your white polish diagonally across your nail. You don't want a completely straight line, however. Just a wandering cloud of white. 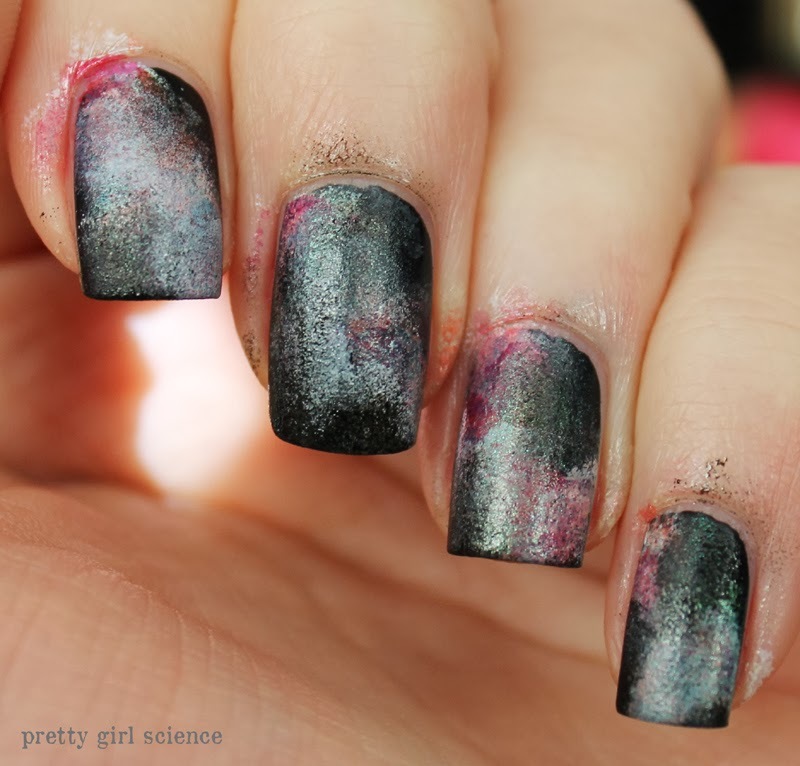 If you find that you are picking up too much polish, you can always add a little base coat, and blot against your foil. 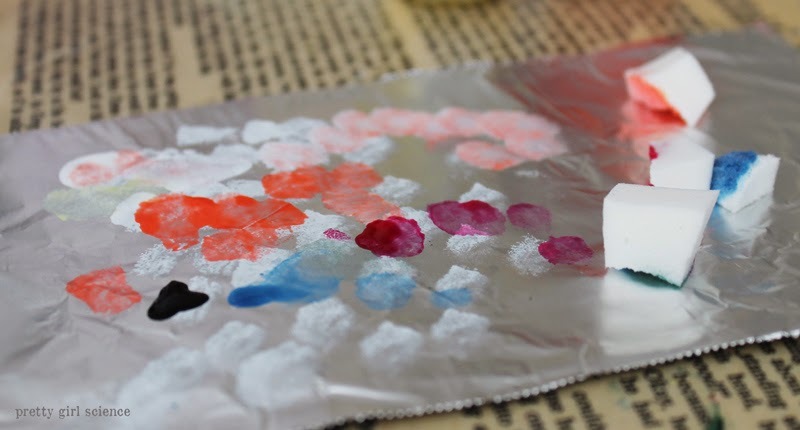 Then lather, rinse, repeat with the rest of your chosen colors. I generally go from lightest-to-darkest, then I add a touch of white here and there to the top. Once the color adding is complete, your "palette" will look something like this. To give your nebular clouds depth and shape, take a clean bit of wedge and some black (or whatever color your base is) polish and blot around the edges. Precision is not important. If you cover too much, you can always go back and add more colors. When you have everything set, add a layer of top coat. If you are a messy kid like me, you'll be ready to do some cleaning up after this. 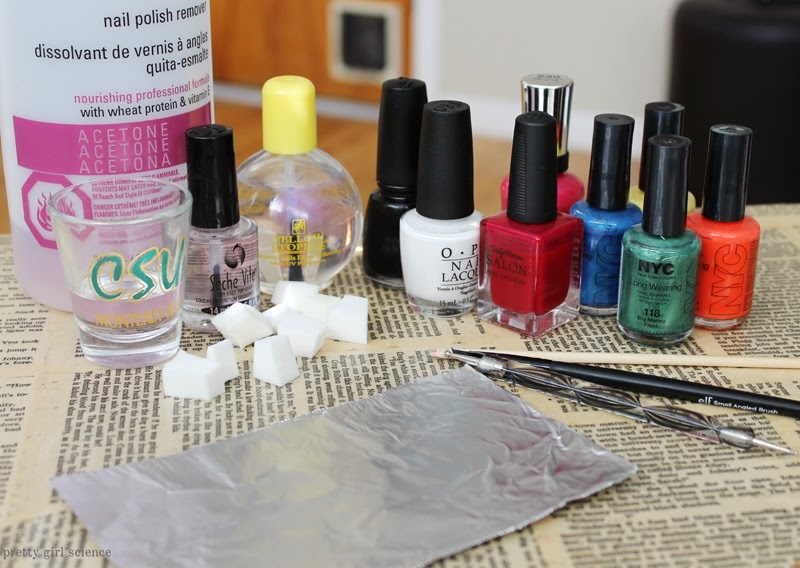 Make a fresh puddle of white polish on your "palette". 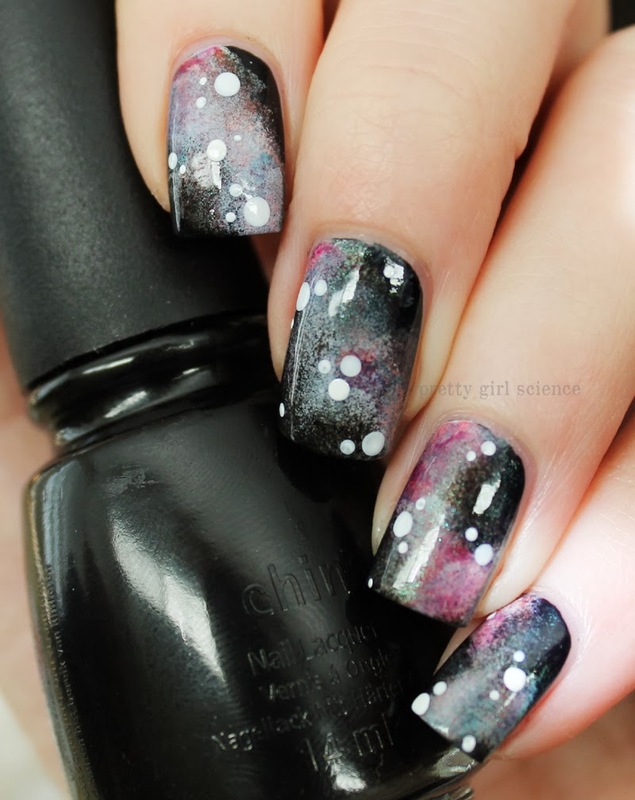 With your dotting tool, dip into the polish and make random little dots. Some people like to make little stars, but I never got the hang of that. You don't want to add too many, just a few clusters here and there. Less is more. I personally like to make them in pairs and trios, but you can do whatever makes you happy. All done! 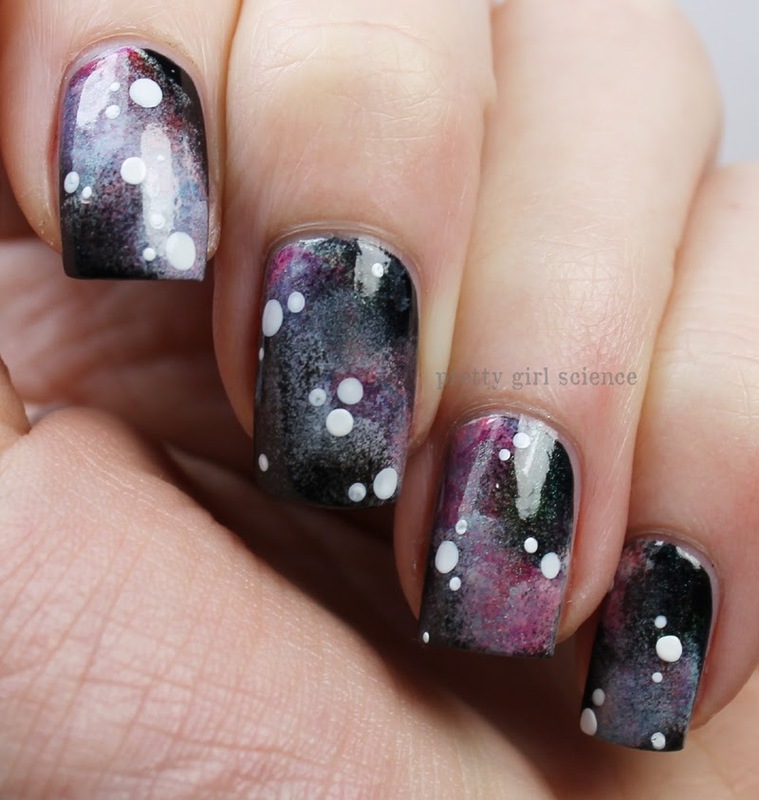 Wait for a while to let the dots set up, then top with a thick layer of topcoat. You don't want your brush to touch the dots, or they'll drag. 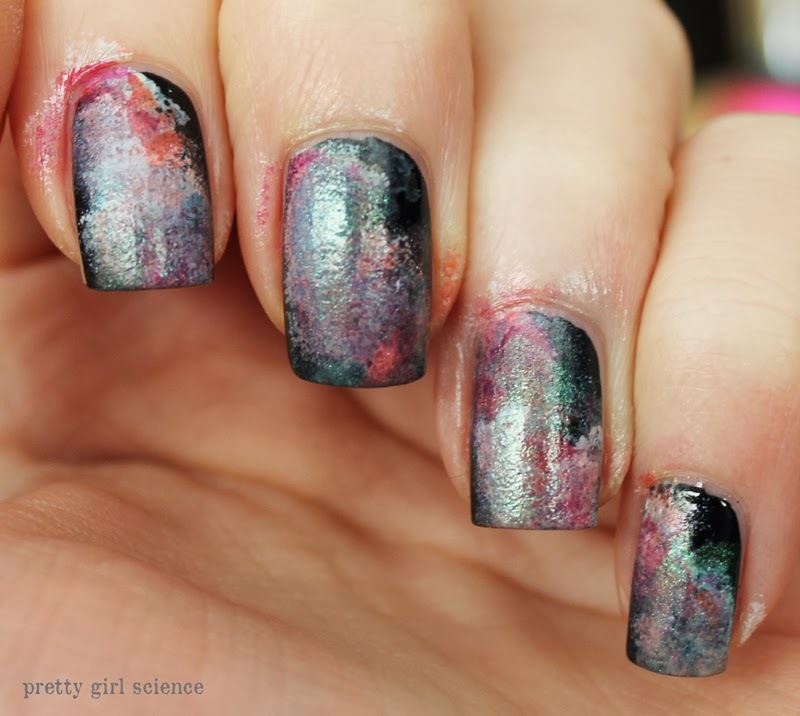 Which might be cool, if you applied the topcoat horizontally and vertically. I may try that next time. Often, I add China Glaze Fairy Dust, a holographic polish, or some spectraflair topcoat here and there. It's up to you if you want glitter or sparkle. This was a quickie galaxy, so I didn't bother. I spent about 30 minutes doing this one, including photographs and dry time. (I only did the one hand). The beauty of this is that you can do this as fast or as slow and careful as you want. If you try this out, I'd love to see it! Love how these turned out, I've tried this before myself and it didn't seem to work, but I am terrible at doing my right hand as my left hand is so shaky all the time. Any tips on how to get nice nail polish on the right hand without having it go everywhere? Honestly, its just practice. I've learned to brace my left hand when I paint my right, and over the years I've gotten better. but really, don't worry too much. just focus on keeping it off your cuticle, and a warm shower will do the rest! 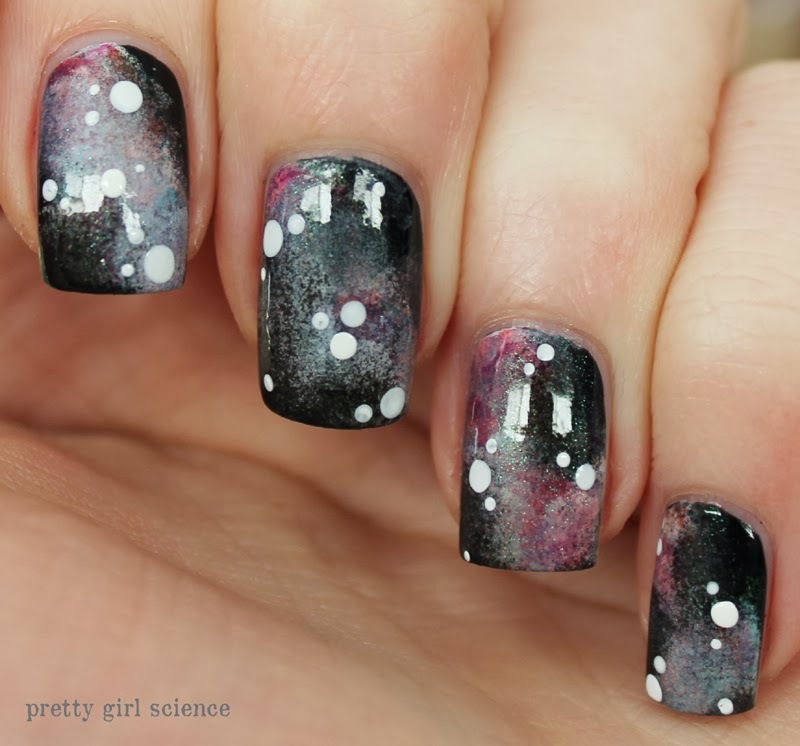 I think galaxies look good regardless of the length of your nails. 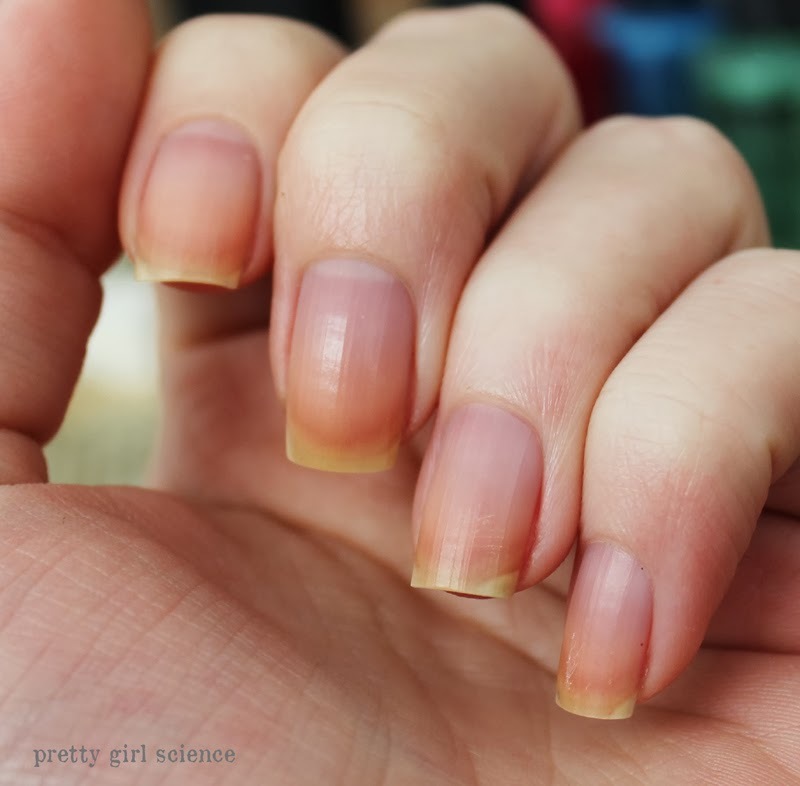 The only thing I've noticed with shorter nails is that you have to just use smaller bits of foam. I'd recommend tearing pea-sized bits off, and using a pair of tweezers to hold them. Then you can get smaller "clouds", which will let you get the full effect.